Where Was This Walkway Located? Caesar’s Alley was a narrow, unmarked walkway, just above 720 State Street, which ran into the southern end of Plaza de la Guerra. Storke Placita now takes up this space. The alley was named after Caesar E. Lataillade, who used the walkway to get from his State Street business to the plaza, where he had a home for a time. Lataillade was a member of a distinguished family, with local roots dating back to the 1840s. Caesar’s father, C.A. Lataillade, was a native of France and arrived here in 1841. He was in the mercantile business, trading Peruvian and Mexican goods for hides and tallow from area ranches. In 1846, he married the youngest daughter of José Antonio de la Guerra, the town’s most prominent citizen. Lataillade began buying a number of large ranchos, eventually totaling some 88,000 acres. He was not fated to enjoy the life of a land baron for long, however; in April 1849, he died from an accidental discharge of his shotgun. This firearm had an interesting history. Lataillade had obtained the weapon as part of a posse in 1848 that tracked down a band of cutthroats who had murdered an entire family and servants at San Miguel Mission. The William Reed family was living at the mission and was slaughtered for the gold dust Reed had recently brought back with him from Northern California. The killers were brought to bay near today’s Summerland and, after a shootout in which one member of the posse was killed, the four surviving desperadoes (one had tumbled off the cliff) were subdued and brought back to Santa Barbara. There, a court quickly convened, found the men guilty, and ordered them summarily shot. Lataillade took one of the men’s shotguns, the gun that ended his life the next year. Lataillade’s widow was pregnant, and in December 1849, Caesar E. was born. In 1854, she married her cousin Gaspar Oreña, and Caesar spent part of his childhood out on the Oreña ranch, La Espada, near Point Conception. He attended school at Santa Inés Mission and lived through the floods and droughts of the early and mid 1860s that impoverished many rancheros. Lataillade’s stepfather suffered heavily, and this perhaps persuaded the young man not to pursue ranching himself. After a stint in a dry goods store, Lataillade entered a three-year apprenticeship in San Francisco as a tinsmith in 1868. Upon his return, he opened his own business in his stepfather’s adobe in the 700 block of State Street. One month later, fire broke out in the hotel next door and spread to the Oreña building, destroying it and Lataillade’s first venture into business. Undismayed, he soon was open for business once again and developed a highly successful hardware firm, which he sold late in 1875. Lataillade became a fixture in the area political scene. He served nine terms on the city council between 1875 and 1903 for a total of 16 years. 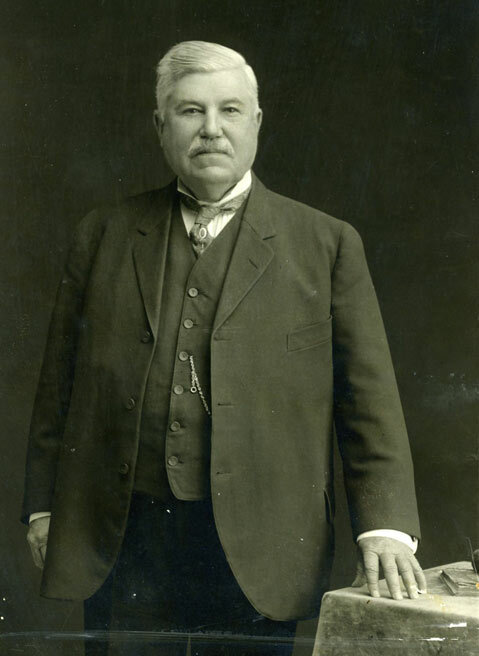 He was instrumental in founding the first city water company, Mission Water Company, in 1872. He was also a key player in bringing gas lighting to Santa Barbara’s streets. Lataillade wed late in life, marrying Acacia Ruiz in 1912. In 1938, misfortune took the life of Caesar Lataillade just as it had his father’s. Struck by a truck, he lingered for a couple of days before succumbing to massive internal injuries. The colloquially named Caesar’s Alley may not be marked, but the Lataillade name has been part of Santa Barbara history for more than 170 years.